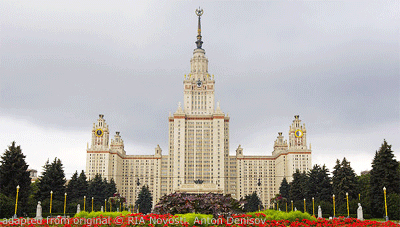 Moscow State University (MSU) has topped a list of the 150 best universities of emerging countries in Europe and Central Asia by the Britain-based Quacquarelli Symonds (QS) education platform. MSU was given an overall score of 100, achieving perfect scores in the academic reputation, employer reputation and faculty/student ratio categories, the online ranking published Wednesday shows. The university performed less well in the international faculty category – which measures the institution’s diversity level – with 53.4 points. The grade did not bring down the university’s leading position because it accounted for only 2.5 percent of the overall score, according to the ranking’s methodology. Earlier rankings by QS placed MSU 108th worldwide and in third place on a ranking of universities in BRICS countries. Another Russian educational institution – Novosibirsk State University – came in second place on Wednesday’s list, with 93.7 points. St. Petersburg State University came in fifth place. Russia outperformed its competitors by a wide margin, with 48 Russian institutions making the top 150 universities list, QS said. Runner-up country Turkey had 16 universities included on the list. QS said it had judged more than 500 universities in 20 emerging countries on a total of nine factors.